From concept to the finished product, we take pride in creating uniquely beautiful landscapes. The addition of properly selected plant life to your property will enhance even the dullest landscapes. 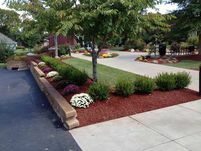 If you have a passion for plants, we can design beds filled with a wide variety of shrubs, perennials, annuals, and bulbs, or design an easy-to-care-for, simple landscaping scheme. Before starting any landscape installation, we will assess your soil quality and drainage. Assessment of soil conditions before landscape installation can help to identify and ameliorate problems that may affect plant growth. The simplest design strategy may include choosing plant species that are tolerant of the soil conditions. 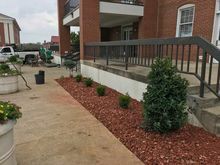 If needed, we can take corrective actions so that the landscape design has the best chance of resulting in healthy plants and low maintenance. 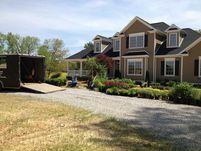 When it's time for a new lawn, we can efficiently prepare and seed your new or existing lawn area. With a grass seed lawn, the most important element for a beautiful, healthy lawn is the type of seed. Our knowledgeable staff has spent the time and effort to find the best seed products. 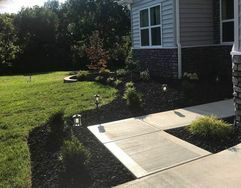 When combined with proper planting techniques by our expert installers, your lawn will be the most beautiful and healthy lawn in your neighborhood. 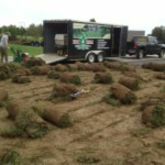 We also offer the installation of sod, which will provide you with a beautiful lawn in just a couple of days. 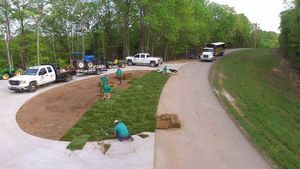 Our turf installation services will check for proper final grade, cultivate to loosen the soil, add soil amendments if needed, and finish grade for a smooth surface. Whether you prefer Kentucky bluegrass or a type of turf fescue, your lawn will look its best in the least amount of time when you plan carefully how and when to install a new sod lawn. 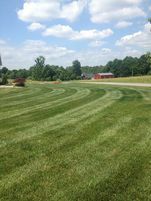 At Green Thumb Lawn & Landscape, we strive to do everything with the utmost care and professionalism. When we install a new sod lawn we are careful to do everything necessary to ensure you'll have a healthy lawn for years to come.